TO BRING THE TRUE STORY OF THE ATTACK ON THE U.S.S. 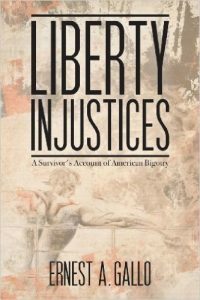 LIBERTY AND HER HEROIC CREW TO THE AWARENESS OF THE AMERICAN PEOPLE. Phil and Dave are on a mission, a mission they will not fail:Get the truth about the massacre—perpetrated on the unarmed U.S. Navy ship by the Israeli armed forces—out to the public via a full-length feature film based on their book, Erasing the Liberty: The Battle to Keep Alive the Memory of Israel’s Massacre on the USS Liberty. Dave refers to what began in an email dated Thursday, October 5, 2017 1:31. Subject: Re: USS LIBERTY MASSACRE HOUR TODAY!!! Body of the email stated: LISTEN LIVE TO USS LIBERTY SURVIVOR PHIL TOURNEY’S NEW RADIO SHOW, “USS LIBERTY MASSACRE HOUR”, ON RENSE RADIO!!!!! Wish you would reconsider the title to something like: END USS Liberty Coverup Hour. I support the Liberty crew and survivors 6-Day War 100% but I will not tune in a show with Massacre in the title. I will wish you luck and persistently pray Godspeed on Resolution 40! I now add I also would never tune into Rense Radio because I am NOT interested in their fare of conspiracy theories and alternative ‘medicine’ but primarily because Rense’s writings and website have been deemed anti-Semitic by the Southern Poverty Law Center. What ensued on the email thread of October 2017 underscored the simple truth that Anti-Semites do not have eyes to see or ears to hear beyond their rigidly fueled anger. Because of being grouped without my consent on the USS LIBERTY MASSACRE HOUR email list-serve and because I was added to a Facebook group that attracts the blind, deaf and dumb; I seize my most precious amendment right -The First- by sharing my first and lasting impression of Dave Gahary who I met at a church in Colorado because I had been inspired by Ernest Gallo, the current and three time USS Liberty Veterans Association’s president who had been on a book tour in Florida and was reaching out to the churches. Hi, I am Eileen Fleming, from New York but I live in Florida. Before that day we call 911, I was a comfortably numb Christian and privileged American. THAT DAY we call 911 irrevocably altered my life and shortly thereafter I realized my childhood dream of being a writer and reporter simply because The Media was NOT asking my questions! I began to research America’s Middle East policies and being a follower of the NONVIOLENT Jesus, I was led to join the Olive Trees Foundation for Peace founded in Orlando by a 1948 Palestinian Muslim refugee from the Galilee who made his way to the USA and realized the American Dream. Dr Diab inspired American Christians, Jews, Muslims and others to learn about the Israeli Palestinian conflict and we raised funds for over 40,000 fruit bearing trees that were rooted on both sides of The Wall before the non-profit disbanded. In 2005, Dr Diab was my shepherd on my first of 8 trips to both sides of The Wall in the Holy Land and shortly thereafter I connected with SABEEL. But I knew nothing about the USS LIBERTY until 13 October 2007, when I heard Phil Tourney speak in California at “The No More Wars for Israel Conference”, which had been dedicated to Israel’s Nuclear Whistle Blower, Mordechai Vanunu. I was asked to speak at the conference because I met Vanunu while in Jerusalem in 2005, and we began a series of interviews that are freely streaming at YouTube and enshrined in hundreds of articles and four of my so far seven books. Before I made the trip to California, a few human rights activists warned me that I should NOT attend the conference because anti-Semites, neo-Nazis and white supremacists would be in attendance! I thanked them for their concern and imagined Jesus would welcome the opportunity to speak to anti-Semites, neo-Nazis and white supremacists and so—I gleefully traveled from Florida and arrived in California to learn I did not even have a room at the Inn where the conference was scheduled to take place. The hotel had also cancelled the event due to complaints that there would be anti-Semites, neo-Nazis and white supremacists in attendance. 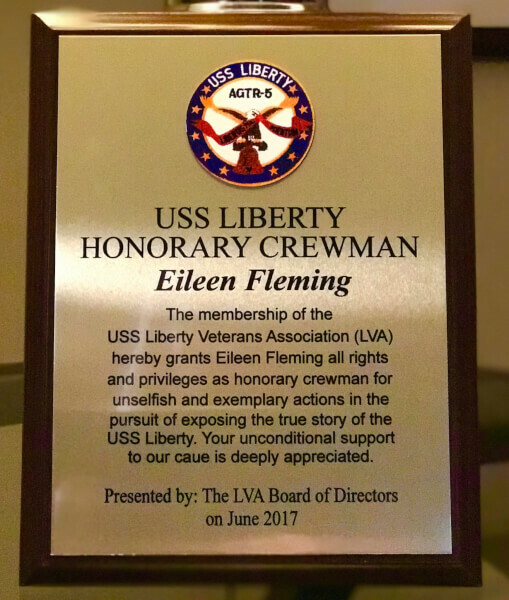 But when USS LIBERTY survivor and then current President of the USS LIBERTY Veterans Association, Phillip F. Tourney spoke about that day in infamy on 8 June 1967, I KNEW why I had made the trip! Tourney spoke in depth about the 34 Americans who were brutally slaughtered, 172 wounded [including himself] all because Israel attacked America’s virtually unarmed premier spy ship the USS LIBERTY while she navigated in international waters during the Six Day War. 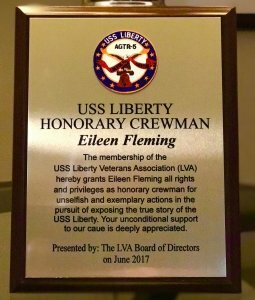 In 2012, I ran for US HOUSE on a platform that included establishing every June 8 to be known as USS LIBERTY REMEMBRANCE DAY. 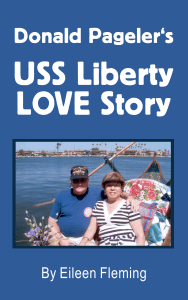 I am here today, to ask YOUR help in establishing USS LIBERTY REMEMBRANCE DAY in the hearts and minds of your families and friends by sharing this USS LIBERTY PETITION! I am also here to remind you that September is Suicide Prevention Awareness Month. Every 65 minutes an American veteran dies by suicide. That’s 22 American Veterans a day and most are our Vietnam era Veterans and our 18-25 year old Veterans. Thank you for your time and for anything you do to help end the epidemic of suicide and in honor of the USS Liberty. [end of my speech]. The applause felt genuine, the crowd laughed at the appropriate times and some attendees took paper copies of THIS Petition away while others signed and returned them to me after listening to Phil Tourney speak briefly in a soft voice and then to Dave Gahary who reminded me of a New Jersey used car salesmen. After the event I spoke my heart to Phil and Dave about how they came across to the back of the room where I sat. THIS POST HAS BEEN READ 34811 TIMES SO FAR. THANK YOU!